Arm Balances Made Easy: Yes, You Can! Sarah Thomson, Heart and Core Yoga teacher, explains how to ease into the following advanced yoga poses. Think you can’t do them? Well, think again! Learn how to successfully practice getting into crow pose, side crow, and handstand. Remember, a little goes a long way. Take it step by step, and soon you will be flying and floating in these fun yoga poses. Arm balances are some of the most exhilarating and exhausting asanas (yoga poses.) They work the arms, strengthen the core, and require full focus and concentration. They are also tons of fun! 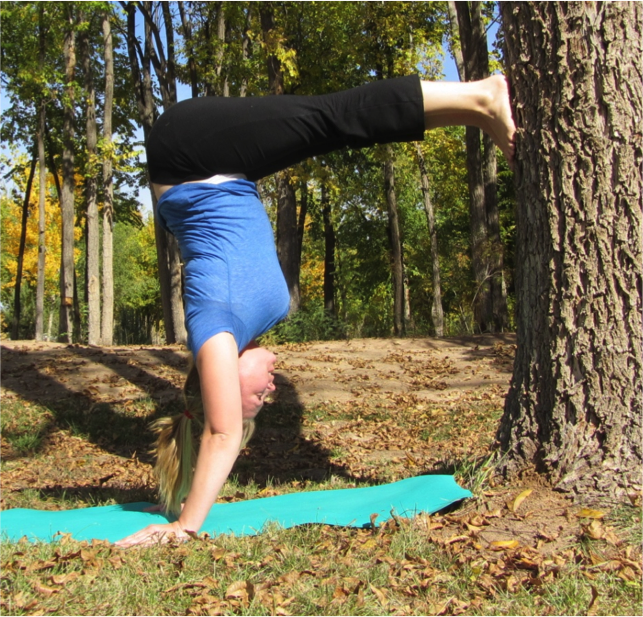 However, arm balances can also be some of the most intimidating yoga poses. It is not a lack of strength that prevents you from performing an arm balance, it’s the fear of falling flat on your face. Some arm balances allow you to slowly ease your way into the pose, while others require full commitment and a leap of faith (as well as a leap of body!). Using props is a great way to reduce some of the fear and intimidation surrounding arm balances. 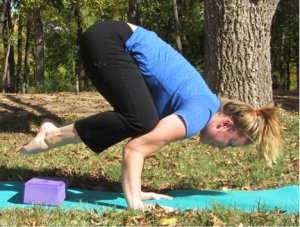 Crow is a great place to start when working arm balances. There are lots of variations, and the best part is you are able to slowly make your way into the pose, backing off at any point if you get uncomfortable. Placing a bolster or a folded blanket in front of your hands can assuage fears of face planting (and can prevent injury should a face plant actually happen!). Starting with the feet on a block is one way to ease your way into the pose. The extra lift you get from the block allows you to slowly shift your weight forward into the hands, and then gently pick up one foot at a time. To Enter: Start in squat with both feet flat on the ground or on block. Place both hands on the ground in front of you, and move knees to the back of the upper arms (even into the armpits if possible). Move the weight of the body forward, look in front of you, make the feet feel light. Pick up one foot, then the other, balancing on arms. Work towards straightening the arms. Think About: Pointing the feet and squeezing abs. Make sure the gaze is out in front of your hands. To Exit: Shift weight backwards and return feet to the floor. Once you’ve mastered crow (or even if you haven’t, you never know what poses will work best for you! ), it is time to try side crow. Side crow can seem much more difficult than crow, but the arms are in almost the exact same position as regular crow; the main change is the twist in the abdomen. Ideally the hips will be supported on the back of one arm while the knees float free. However, while you are still working on this pose, I suggest the “cheater” version, in which both the hips and the knees are supported by the backs of the arms. As you become more comfortable with side crow you can work towards supporting the legs with only one arm. You can use a block in side crow much like in crow, for extra lift under the feet. A block can also be placed in front of the arms that will support the chest as you move into side crow. Play around with the position of the block if you try this variation; you don’t want the block under your neck, but under the shoulder or chest. To Enter: Start in chair pose (utkatasana), bring hands to heart center and twist, catching left elbow on the side of the right knee to deepen the twist. Place hands on the floor and enter the pose from here, or squat down all the way. Bend elbows into chaturanga arms and keep the outside of the right leg stuck to the left elbow. Lean forward, move weight into the hands and lift legs, keeping them together. “Cheater” Version: Place right knee on left elbow and right hip on the right elbow to help get into the pose and get a feel for it. The support of the hip on the right elbow helps you to balance the body. Work towards supporting your legs only on the left elbow. To Exit: Shift weight backwards, return feet to the Earth. Handstand is one of those poses that requires a leap of faith. To enter the fullest expression of the pose, you must kick both legs up high into the sky with no support! The best prop you can use to help ease your way into handstand is the wall (or a tree!) Instead of doing handstand against the wall, and learning to kick slightly past vertical, I suggest practicing half handstand. In half handstand, you are bent ninety degrees at the waist, the upper body is in handstand while the feet rest on the wall. The legs should be parallel to the floor and the hips should stack directly over the shoulders and hands. This is the best way to gain the muscle memory of handstand. From here you can play around with lifting one leg to vertical, hold for five breaths, and then switch. Eventually you will get comfortable enough being upside-down and try kicking up in the middle of the room! To Enter: Begin by sitting with your back against the wall and your legs stretched out in front of you. Take note of where your feet are; you will want to place your hands in the same place as your feet so that when you are upside down your body makes a right angle. Place your hands in the noted location and come into downward facing dog with your heels against the wall. This down dog will likely be shorter (feet and hands closer together) than your usual down dog, that is ok. Pick up your dominant leg and step it up towards the wall, placing the ball of the foot against the wall. Kick your weight into this foot and step the other leg up to meet it. You may have to readjust your foot placement; it can help to have a buddy nearby to tell you when your legs are parallel to the Earth. It may feel a bit strange or intense; hold for as long as you feel comfortable. Think About: Stretching from hands to the hips by keeping the spine long. There is a tendancy to slightly arch the back, so engage the abs to keep the body hollow. Keep pressure in all fingers and heel of hand and play around with shifting the weight to different parts of the hand. When you start to do full handstand in the middle of the room, the hands play a huge part in keeping you balanced. Look straight down with eyes (not whole head) or look directly behind you and try to keep the neck long and in a neutral position. To Exit: Slowly step your feet back to the earth. Drop the knees down to the mat and rest in child’s pose for a few breaths. Sarah teaches Tuesday evenings from 7-8pm.